The CTA Intelligence European Performance Awards, now back for their fourth year, will be an evening of recognition and rewards for those CTAs and managed futures funds that have outperformed their peers over the past 12 months. Please note that entries are not accepted for those categories marked with *. 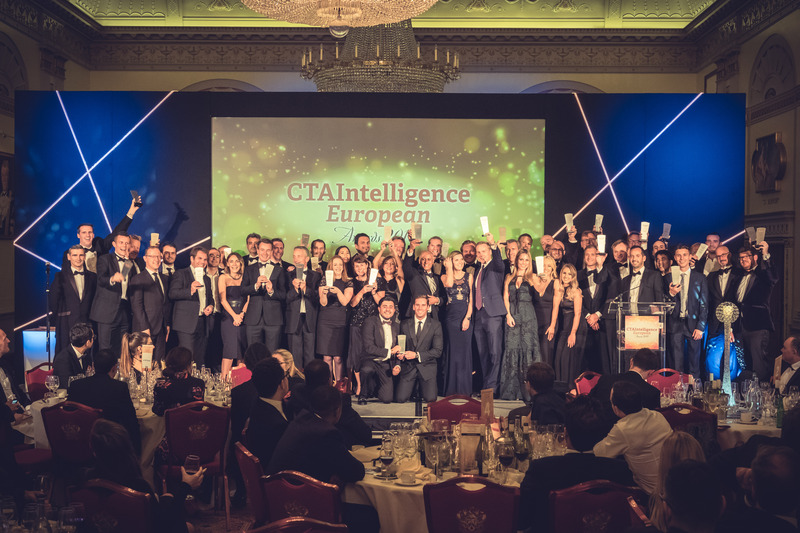 Only CTAs with their management/advisory company or team based in the UK or Europe will be eligible for the CTA Intelligence European Performance Awards 2018. The entry form link will be sent to all managers and contacts in the CTA Intelligence database. Other interested managers can access the online entry form via this website. CTAs interested in entering the awards must submit all information via the official CTA Intelligence European Performance Awards 2018 online entry form. The awards will be publicised internationally in the general and managed futures media. All awards finalists will be honoured—and the winners announced at a dinner on Thursday, 20 September 2018 at Plaisterers' Hall, London. Please mark this date in your calendar. The final deadline for inclusion is Friday, 27 July 2018. CTAs entering the newcomer category must have a minimum of $1m in AuM ending 30 June 2018. CTAs entering the emerging CTA category must have a minimum of $10m in AuM ending 30 June 2018. CTAs entering any other category must have a minimum of $20m in AuM ending 30 June 2018. CTAs entering any of the categories except long-term performance, alternative markets CTA, multi alternative risk premia fund, emerging CTA and best newcomer must submit a track record of 3 years ending with their June 2018 performance figures. CTAs entering the long-term performance categories must submit a track record of 5 years ending with their June 2018 performance figures. CTAs entering the alternative markets CTA, multi alternative risk premia fund, and emerging CTA categories must submit a track record of 12 to 36 months of performance data ending with their June 2018 performance. CTAs entering the newcomer category must submit a track record of 6 to 18 months of performance data ending with their June 2018 performance. Please note that entries are not accepted for those categories marked ‘nominated’. The judging process is rigorous and thorough to ensure that all the entries receive full consideration and that the most deserving winners are chosen. Judges will take part in a judging conference call, where the winners and any highly commended entries in each category will be decided. Judges have discretionary power to move submissions into alternative categories that they think may be more suitable. All judges are required to sign a disclaimer form to keep information about entries and the winners confidential. The judging panel will comprise representatives from CTA Intelligence, leading institutional, private investors and other industry experts. Each member of the judging panel will have an equal vote in deciding the winners in each category. Decisions should be unanimous, but a majority will suffice. Judging decisions will be based on performance, qualitative information and structural criteria. The CTA Intelligence Performance Awards 2018 will take place in London on Thursday, 20 September 2018. The price for the 2018 Awards includes a table of 10 seats at the ceremony, drinks reception and three-course dinner. HFM Members received a discount on their booking to the awards.